It's just about noon on the 4th of July here in the U.S. of A. We all got a good night sleep for the first time since returning from Japan on Tuesday, so life is good. We are still getting settled, but soon all will be back in order and the camera will come back out again. In the meantime, it is good to be home. It's a few hours later. 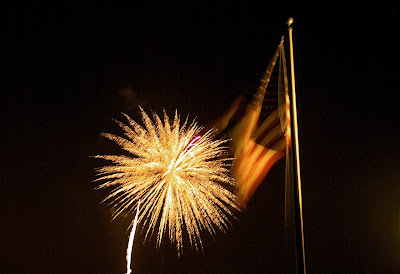 Here's a shot of the fireworks at Radnor Highschool.